This page includes rules and guidelines for posting on our Facebook page. This is our page and we ultimately have the say on the content and tone. We do not ban on a whim, but anyone criticising Madeleine or her family in any way, will be banned. This is not a place for you to post your negative opinions about the McCann family. We are not a debate page or a place to analyse the investigation. This is a support and information page for Madeleine's family and the Official Find Madeleine Campaign (findmadeleine.com). If you feel these rules are something you cannot abide by, please unlike the page. We don't care what you think about leaving children alone. It's been six years, let it go already! Posting your perfect parent advice will be deleted and you will be banned. Do not post sensitive information. If you are unsure whether something is sensitive or infringes on someone's privacy, please Email Webmaster@findmadeleine.com. We will answer your questions as quickly as possible. Let's keep the page positive. A heartfelt thank you to each and every one of you for supporting Gerry, Kate, Sean, Amelie and most of all, Madeleine. Let's get her home! We would like to thank everyone who helped in the search for Mikaeel Kular. We came together as a community to help the search and unfortunately the outcome is heartbreaking. All of you should be very proud of how you came together to help find this precious little boy. Out of respect for Mikaeel and his family, we are not allowing comments on this post. Rest in peace sweet boy and may your family find comfort in the midst of grief. The search continues overnight in Scotland for a 3-year-old little boy who went missing from his Edinburgh home sometime after being put to bed last night. Mikaeel is described as 2 feet tall with a faded scar on the bridge of his nose and a sore on the left hand side of his mouth. Police believe he may be wearing a thigh-length beige jacket with a grey fur-lined hood (pictured below); black gloves with multi-coloured fingers; dark navy blue jogging bottoms; a grey pyjama top featuring an embroidered turquoise dinosaur on the chest; and brown shoes with two velcro straps. "I would ask local residents to think about their own homes, their gardens, their buckets, their outbuildings. Anywhere you think a three-year-old boy might be. Keep your eyes open in parks as well,"
PolIce have activated the NATIONAL CHILD RESCUE ALERT SYSTEM to help them trace missing three-year-old Edinburgh boy, MIKAEEL KULAR. Police are seeking information from anyone who has seen Mikaeel or anyone matching his description in the past 24 hours. Tess Hagan Without sounding like a complete bizarre person... Could you do tshirts that are more like the old ones you did... My kids have worn them as nighties since she disappeared - which might sound odd but my daughter is 1 month younger than Madeline and took it to heart.. so Madeline doesn't sleep on her own she where's a nighty (large tshirt).... I thought she would grow out if doing it but she hasn't... Every night since the day she found out maddie was missing. Anyone who whinges above - shush! This could happen to anyone at any time and anywhere! I would like to remind those new to our page that Gerry and Kate will only comment on the investigation to find Madeleine when and if any updates FROM THE POLICE warrant a statement. Please allow the police to do their jobs and not speculate or fuel rumours. We will not answer questions related to unfounded and speculative press articles and we ask that you not post them on our page. We've had questions regarding our online store being unavailable and when will it be available again. Google Checkout was retired on 21 November. Because Google Checkout is no longer available, we are redesigning our online store with another merchant system. I'm finishing the design/setup and will have the online store available soon. Thank you for your patience while we make this change. Gerry and Kate will only comment on the investigation to find Madeleine when and if any updates from the police warrant a statement. Please allow the police to do their jobs and not speculate or fuel rumours. We will not answer questions related to unfounded and speculative press articles. We once again urge any member of the public who may have information relating to Madeleine's abduction to contact the police in Portugal or the UK. Thank you to those who leave lovely comments. Anyone posting about leaving the children, will have their post deleted. We've heard it all before. We will not allow those comments on this page. The criminal here is the person that took Madeleine! If you don't agree with that, unlike the page and move on. We will NOT tolerate abuse of any kind on this page. Where did you hear that the sighting was a hoax, Alex? Jacob it is all over the internet, but we do not know for sure. Portugal doesn't mean the case will be reopened, it is part of a routine meeting. I hope this is not a hoax. So hard to hear, can only imagine Kate, Gerry & the twins' pain. Could only be a rumour but: Are you going to settle out with Amaral? I've asked for the third time now. Is it too hard to answer with a simple yes or no? Marvin it may not be our business in all due respect. I think you will see under another thread here webmaster has said it is a rumour only. @ Marvin, we do not discuss legal or investigation issues on this page. I have heard you are going to settle out of the libel trial against Amaral to his terms. True? If so why? If he has lied there is no reason to settle out. You would win! You would lose a lot of money if you settle to his terms! Maybe some newspapers and the other financial backers could help you out with some money? But the bis question remains: Why? I think Amaral lied!!! We know Amaral has lied so I hope this rumour is not true. Is Scotland Yard actively searching for Madeleine at the moment? Or is it paperwork only? If they are not searching then it would be better that you do not stop your own investigation! Madeleine could be found in the meantime while Scotland Yard is looking through the papers. In that case why has your own search stopped? But you did it so I guess Scotland Yard is actively searching. Could somebody please tell me if Scotland Yard is effectively searching for Madeleine? I have asked yesterday but have not got an answer. If the Police is not actively searching it would be better to go on searching with private investigators instead of stopping the search and not employing private investigators. Time is important here I think. So why stop searching? It would only be understandable of course if the Police is searching. If there is not enoug money in the Fund because it is needed for example for the expected payouts regarding the libel claim which will probably not take place then someone should help you out! Help Dyfed-Powys Police find missing five-year-old April Jones whose disappearance is being treated as a suspected abduction. She was last seen yesterday wearing a purple knee length coat getting into a grey or light coloured van near her home in Machynlleth at 7pm. Call 0300 2000 333 with any information. 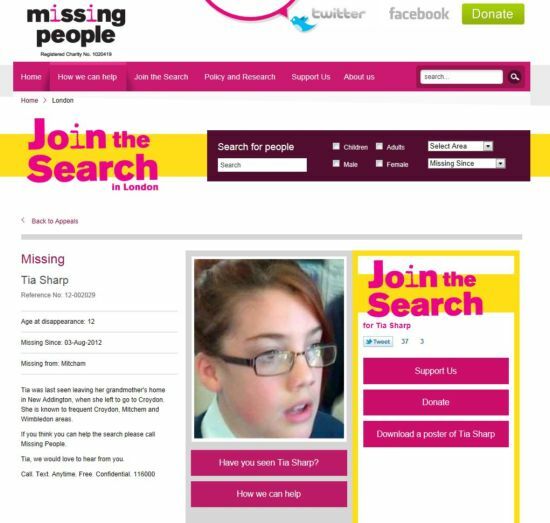 Have you seen Tia Sharp? If you have any information on her whereabouts, please contact Missing People immediately at 116 000. Please keep Tia and her family and friends in your thoughts and prayers. Driving wondering what to give up to experience some pain she has suffered I was sent this message a three day fast. After six months of wondering what is the best thing to sacrafice. I will fast from April-April 2nd, 3rd, 4th every month, for her suffering, I want others to try over 3 days in May the before day, the day, and the day after for her and think of her and say prayers for her and her family. I challenge all you food addicts to do this in hope we feel the some of the suffering. Even Just for 3 days, I will do 36 days of the year 12 months 3 days a month and praying. So there is nothing worse than loosing your children in a terrible country with a stupid cop investigating, when they are into kiddie stuff also. So when you can not trust man who do you trust? So 365 days of prayers almost over and still waiting for a discovery in which I believe and hope before she turns 10 years. Who is interested in a 3 day fast every month on the 2nd and 3rd and 4th day while praying to God. I am keen I challenge anyone else to it. You can drink water, tea, coffee etc but no food for 3 days every month for one year. We must all suffer as she suffered and go through this for other children also, to keep us more compasionate. Madeleine is always on my mind hoping that she will be found soon. Keep the search going. ‎@Elizabeth, can you send us the picture or put up a link here? Webmaster@findmadeleine.co​m. Thanks! Join Turning Stones for Madeleine by contacting maxine-tsm@hotmail.co.uk. This is a message to the perpetrators who stole Madeleine from her Loving family.beware you might be watching this page......so remember this i dont suffer fools gladly im on to you now and iil be bumping into you all real soon you know who you are.so do the right thing and hand her over NOW ! If you have any questions, please Email us at Webmaster@findmadeleine.com. Thanks Wendy and everyone else who keep #findmadeleine going on Twitter. I would like to know, why have you taken off the link to Ben Needham from your 'likes' on the left hand side off your page , the link has 'disappeared'? I am listening to the Leveson Inquiry and I am appalled at what you have had to endure at the hands of the Press and those people who were leaking made-up stories about you, your family and your friends. I really do hope that Portugal's public Ministry, in light of what is emerging from the Leveson Inquiry, conducts their own inquiry into who was leaking this material to the PT press and worldwide media. The harm this has caused you and your search for your daughter is unimaginable. My thoughts are with you and your family and may Madeleine be found soon. They really don't know the damage they caused by printing inaccurate and accusatory headlines like they did. But the press are only half to blame, the real blame lies with those that decided to leak these untruths. Wholeheartedly agree Bren. Whatever possessed them to do such things? Pam, I don't think it is a case of whatever, it is whoever. Let us hope that Scotland Yard find the personal responsible for taking Madeleine and reunites her with her family. I am with you there Bren...it is the who. Hope that person or perhaps persons is found soon. Sign up for Twitter to follow Find Madeleine PT (@FindMadeleinePT). Official Campaign to Find Madeleine McCann Portuguese..
‎@Lisa, please do share out Portuguese page. Thanks! Do YOU hold the missing piece of the puzzle? Do you know who these people are? Email us at Investigation@findmadeleine.co​m if you have any information on who these people are or if you have any information that can help us get Madeleine home. Was just wondering how interest in the Car Stickers is doing?. Particularly for those folk driving abroad, these are such a good way of getting Madeleine's profile raised. I'm sure there are many folk who do not even realise the search is happening, and would see that and be supporting too. I drive via the airport as a route to get the word around and have seen folk showing an interest in the phone number. Some have jotted it down. Onwards and forever upwards for Madeleine. ♥. I am so pleased to find this official site to share my thoughts about Maddie. I only know of her from headline news but what happened to her could happen to anyone. I continue to pray for the McCann family. Gerry and Kate are continuously touched by the kindness of strangers. Glad you are here Janey (and everyone else). I have just tried to buy the Holiday pack, as I am going on holidays next week, but there was an error when I tried to pay with paypal? So I couldn''t do it, can someone help me get around this, as I really want to buy the pack please. @Sarah, please write to our campaign coordinator and ask her to send you a holiday pack (Campaign@findmadeleine.co​m). Please come forward and reunite Madeleine with her family. ‎@Breda, we feel that way too. Someone knows these people. Thank you all for the kind comments and continued support. Happy new year. May 2012 be the year when Madeleine comes home. Thank you to all who continue to show us love and support. Have a wonderful Christmas. We have posted our Christmas message. Please view and pass it on. If you hold the missing piece to the puzzle, please come forward and reunite Madeleine with her family. Thank you all for the lovely messages. Please don't forget, we also have a messages area on our Web site. Never give up hope.. someone holds the key to finding your daughter, let us hope they have the courage and decency to reunite a missing child with her family. Please consider taking a holiday pack with you on your next trip. Thanks to those who have kept our awareness campaign going. Is it possible to pay for this pack by paypal? ‎@Sarah, that's actually how you pay for it in the online store. If you are having problems, please Email our Campaign Coordinator. ‎@Leah, we hope people will share it. Leah, it will be up sometime next week. Mark, we love this idea. We will post up a picture soon that you can use for your profile picture over the Christmas holiday. I have posted twice now asking for information regarding gap-year students taking information packs abroad....had one (fairly ambiguous response), and asked for further information, but nothing has been forthcoming. Is this wall manned? Is it not a worry that people are trying to make an effort to take things forward in the search for this poor girl, and it's not being followed up? I have seen other posts to this effect on here too. Eileen, we did see your posting and we posted a reply. We are still needing gap year students for help with our awareness campaign. Please Email campaign@findmadeleine.com​ and our Campaign Coordinator will give you the details. Thanks. Thanks! I didn't understand your reply, and asked for more details, but heard nothing. I just had a look on your website, and see the poster packs have to be purchased, is that right? Yes, I'll email your campaign co-ordinator. Thanks again. I work with dental students, most of whom travel abroad for an elective in final year, and it would be good if they could take along posters/leaflets, I think. Thanks again. We would love for them to do that. It's better to chat with our Campaign Coordinator about this though. She can get you all the materials you need. Thanks. I'll email her and get things going with this! Someone tell me what I can do to help and if it's within my power then I'll do it. The whole McCann family are always in my thoughts, including Madeleine, who I feel inside is still alive. Sending love and strength to Kate and Gerry at this difficult time of the year. I dont understand...if your looking for her still, why are you turning it off for the weekend? Do ya think she will only be found Monday - Friday??? Pamela, you can always email the findmadeleine team anytime you need to. P** G** I have liked your comment Pamela in the hope you will see mine? Well they deleted my question, so therefore I will delete the page all together. I'm sorry....however I don't think that they are all that concerned to begin with. As a mother of 5, I would NEVER leave my children unattended in the manner in which these children were, who leaves their kids at that age, on vacation no less...I feel so bad for Madeleine..God only knows what has happen to her due to negligence . So go ahead and turn off the wall comments...we were all shown a long time ago how much concern is displayed for this precious little girl. Ever since this story aired, I have felt ugly t'words the parents. Shame on you both and pray to god that Madeleine may EVER forgive you. I have just sponsored a light on The Milford Care Centre for Madeleine. This light will shine throughout the festive season. This sponsored lihht is dedicated to bringing Madeleine home. In other words A Christmas Light Shines in Limerick Ireland to light her way home. Pauline, that's really lovely. Thank you. Why not send them to journalists who support Maddie? People like Jeremy Vine he has lots of famous people on his show on radio2 and they would all see it. Loraine Kelly and people like her? Carol, i feel that your sentiments are echo-ing mine too, and i'm sure there are so many of us who so desperately want to see her home where she belongs but can't effect that . Like you, hope is in my heart and regular prayers, even though it's been 4 years and more. Madeleine is out there, and every last little effort made by each supportive individual adds up to massive potential for a breakthrough. Madeleine is looked-for and loved. Keep strong!!. Kate and Gerry, keep strong too. We are all supporting your massive efforts for your lovely Madeleine. ♥. You said it from your heart and what you said was perfect. Same looking girl, same looking woman and very probable location..What can I do more or better? Henri, I do remember your past Emails due to the pictures you sent in today. We will respond to you privately regarding your report. Thanks for sending it in. Have you seen these people? Do you have information that can lead us to finding Madeleine? Did anything ever happen about the suggestion to ask "gap-year" students to take Madeleine fliers away with them? I remember posting at the time, that I work with students, whom I could ask to do exactly this, but didn't hear anything back? Eileen, i remember the post. I shared it at the time on my wall, and asked those students i knew to share on. That is probably the quickest way to do it, as a constant sharing of info that Fliers and Tags, posters etc can be bought and put up. There is nothing stopping us from doing this on a constant basis, sharing so we can keep Madeleine's profile up high where it needs to be. :-). Eileen, we are still looking for help from gap-year students. If a student would like to take on the organization of this aspect of the campaign, we would love the help. Ok, that's interesting - what do you mean by organisation of this aspect of the campaign? Thanks. ‎@Eileen, Scotland Yard are doing a review of Madeleine's case and following-up on all leads.